Last week the B.C. Liberal government approved the Trans Mountain Pipeline Expansion Project. They have stated that Kinder Morgan has met their five conditions and have added 37 new conditions with their approval. From the National Energy Board hearings, to the recent to governmental approval, the process was problematic right from the start. It was nothing more than a public relations exercise. Last week the B.C. Liberal government approved the Trans Mountain Pipeline Expansion Project. 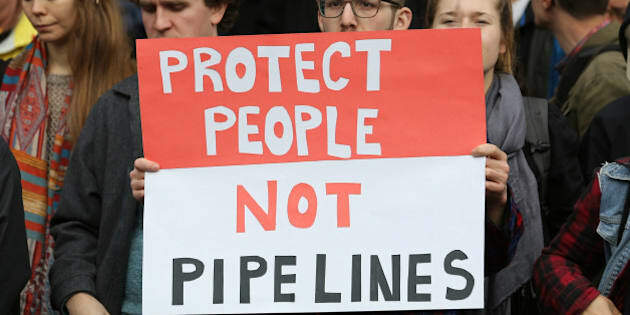 They have stated that Kinder Morgan has met their five conditions and have added 37 new conditions with their approval. From the National Energy Board hearings, to the recent to governmental approval, the process was problematic right from the start. It was nothing more than a public relations exercise. With this decision comes a more than 500% increase in diluted bitumen transports through the Salish Sea. I have heard consistently from all communities in Saanich North and the Islands that this project is a top concern, and so it should be. It threatens our coastline, our wildlife, our tourism industry and our quality of life. We have seen opposition from communities and First Nations all along the route but it has been the strongest on the coast. The mayors of Vancouver and Victoria have been unequivocal in their opposition. I was an intervenor in the National Energy Board (NEB) hearings for the project. I can say from first hand experience that the review process established by the Harper Government, and subsequently supported by Prime Minister Justin Trudeau, is not one in which British Columbians can have any confidence in. The evidence was not tested, questions went unanswered, assurances were vague and often inaccurate. At the very least, Kinder Morgan should have been expected to show that they can clean up a dilbit spill to get approval. But they haven't - because they can't. The B.C. Liberals promised that any heavy oil pipeline would have to meet their five conditions before it was granted. Do we suddenly have a world-leading marine oil spill response...no we do not. Do we have world-leading practices for land-based oil spill prevention... no we do not. Have we addressed the legal requirements regarding Aboriginal and treaty rights... no we have not. Does a few million dollars each year give British Columbia a "fair share", due to the high risk we are accepting...hardly. A year ago the B.C. Liberal government said a firm "no" in its final written submission to the NEB (a 72 page document) to this pipeline because it did not meet these conditions, now they have suddenly reversed course and approved it. The Dogwood Initiative, a grassroots organization against oil tankers on B.C. 's coast, predicted that the B.C. government would approve the project. They have done a lot of work to expose Kinder Morgan's lobbying efforts with both provincial and federal governments. Thanks to the work of Dogwood and other organizations, we know that the pipeline proponent met with federal representatives including with Ministerial and PMO staff 368 times in a five-year period, in that same time they lobbied the provincial government 458 times! Kinder Morgan itself has donated more than $28,000 to the BC Liberals in the years leading up to 2015 - after that, they stopped donating to the BC Libs in the company's name. But that's not the whole story. Some of the pipelines biggest customers include Nexen, Devon, Canadian Resources Ltd, Cenovus Energy, Imperial Oil and Suncor - all of which have contributed substantially to the B.C. Liberal coffers. The Canadian Energy Pipeline Association lobbying group was another large donor to the BC Liberal Party. When we combine the donations from all of these organizations over the last decade, we get a total of almost $720,000 donated to the BC Liberals! So why did the B.C. Liberals reject it in the first place? Politics. They knew that they could hide behind the Federal NEB process and "stand up for British Columbia" without having to do anything. Once the Federal government approved it, that changed the stakes. Now there was the political pressure from the Federal Government, the neighbouring "left-leaning" Alberta Government, and let's not discount the lobbying and donations from the oil industry itself. First, Notley visited British Columbia to sell the project, followed by a visit from Trudeau who also promoted his approval. They both claimed the project was good for the climate and part of our climate strategy. Rubbish. The B.C. Greens are not against all industrial projects - but we're fully against this type of process. It is no way to build public confidence in a major industrial project. This is irresponsible decision making fueled by unlimited lobbying and large corporate donations, that is not in our interests. That's it, plain and simple. The B.C. Liberals' approval not only undermines our environment and the communities directly affected, it undermines the role of science and evidence, our climate responsibilities, and all of the economic sectors that will be negatively impacted by industrializing the Salish Sea. We have to transition away from fossil fuels. Mark Carney (the Governor for the Bank of England and chair of the Financial Stability Board) recently wrote that the Carbon Bubble is starting to look more and more dangerous for the world economy. This project takes us in the completely wrong direction by investing in fossil fuel infrastructure that will last decades, and which poses serious long-term environmental and economic risks. The 21st century is increasingly powered by the innovation found in the creative economy. Indeed President Obama recently made a convincing case in the journal Science that "the trend towards clean energy is irreversible." Instead of doubling down on the industries of the past, we need to be making investments in the future. I have stood up for the interests of our riding throughout the NEB process and I will continue to stand up for the Salish Sea. I am running in this election with the BC Green Party -- the only party that has consistently opposed to this reckless industrial project. There's a hopeful future where BC is a leader in the new economy, but it needs new leadership to get there.